Lay out and framing for a arched doorway will use the same method no matter how wide the door is or what radius is desired. The easiest way to build a arched doorway is to use 1/2" plywood to layout your arch and 2x4 wood blocks to get the desired depth of the door way. 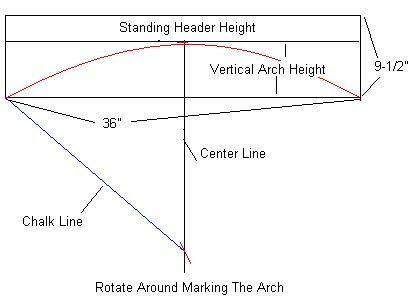 Before laying out your arch on the plywood you will have to determine the standing header height at the center of the arch and the vertical height of the arch. The standing header height is the distance between the bottom of the doorway header and the top of the arch, you can eliminate this measurement on existing doorways to keep the current height at the center of the arch. The vertical height of the arch is the vertical distance from the top of the arch to the bottom of the arch. These measurements will determine the final over all width and length of the piece of plywood and key layout points. The final length of the piece of plywood will be how wide the doorway opening is. Follow the steps below to lay out a arched doorway, these steps are described starting with a 4'x 8' sheet of 1/2" osb plywood. 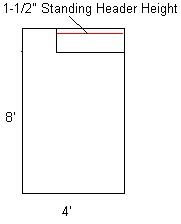 And for example purposes I will be using a 36" door width, 1-1/2 " standing header height, and the vertical height of the arch will be 8". 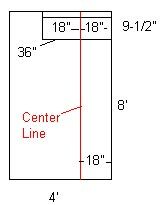 This would make the final over all height of the piece of plywood 9-1/2" and the width will be 36". Using a chalkline lay out a 9-1/2" x 36" square on the piece of plywood . Measure down from the top 1-1/2"(or desired height) and snap a line, this makes your standing header height. Skip this step to eliminate this measurement. Using the chalkline snap a center line from the top to the bottom of the sheet of plywood. 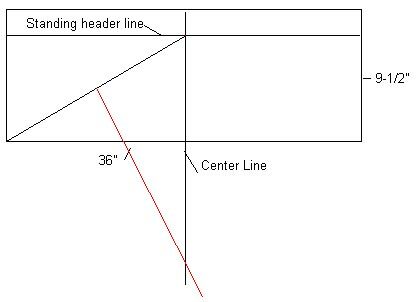 Snap a line from the bottom of the arch to where the center line and standing header height line intersect. Or if you skipped step 2 the top of the sheet and center line would be the desired location. Measure the distance between the two points in step 4, divide that measurement in half and make a mark on the line to get the center of the line. Using a framing square, square off the line made in step 4 down towards the center line and aligning with your center mark. Make a mark along the square with a pencil, then extend that line using the chalkline till it intersects with your center line. Tack a nail where these two lines meet. Hook the end of the chalkline onto the nail, wrap the line around your finger where it lines up with the bottom of the arch. Holding the line move it to the top of the arch, where you wraped your finger around the line should line up with the center line and the standing header line. Moving it to the other side at the bottom of the arch should also align with where you wraped your finger around the string. Holding the chalkline and starting at the bottom of the arch(either side), rotate around to the other side of the arch marking with a pencil. Cut out the arch using a jigsaw. 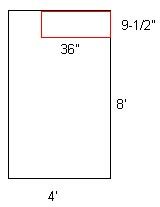 Using a circular saw cut out the main pattern, this would be the 9-1/2" x 36" square. Use this pattern and trace it onto another piece of plywood and cut it out so you have two pieces of plwood with the arch cut out. Now the two pieces of plwood are 1" together, if the wall is a 2x4 wall you would cut your blocks 2-1/2". This would make a total of 3-1/2" with the plwood and the blocks making the arch 3-1/2" in depth. You want the arch to be flush with the studs in the wall so drywall can be installed over the arch. Now that you have your depth for the arch, cut some 2x4 blocks for spacers between the two pieces of plywood. Nail the blocks around the outside perimeter between the two pieces of plywood. Now you are ready to install the arch into the doorway.